signed with monogram and dated 1892 l.l. 35 by 30cm., 14 by 12in. been drawn between Rossetti's Beata Beatrix (various versions, one of which is at Birmingham Art Gallery) and pictures by European Symbolists such as Redon, Lévy-Dhurmer and particularly Khnopff. 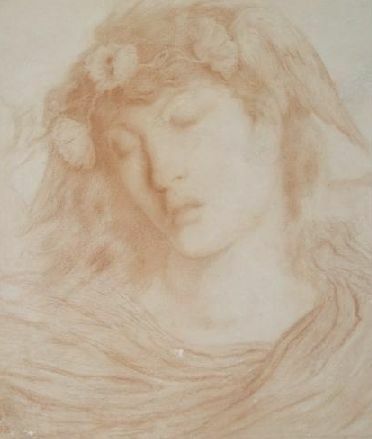 Hypnos, the God of Sleep is a variant of Solomon's The Winged and Poppied Sleep of 1889 (Aberdeen Art Gallery). I just love his work, so delicate. Shame about his tragic life - but perhaps that was the price for his genius.